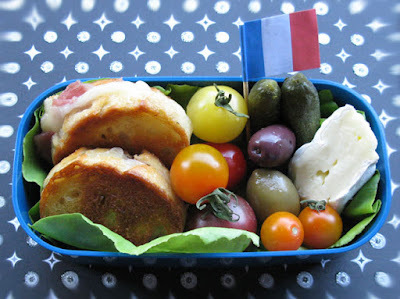 I just couldn't let the Bastille Day holiday pass without one more frenchie bento. Croque Monsieur is a grilled ham and cheese sandwich that is quite popular in France. I made these with slices of baguette, Fra'mani Rosemary ham, and emmentaler cheese. Also in this bento: a selection of multicolored cherry tomatoes, olives, some homemade cornichon pickles, and a hunk of brie cheese. 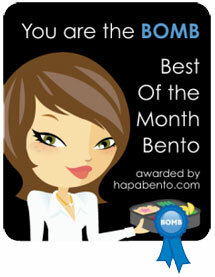 This bento also works in the Bento Summer School series. This week's lesson is about sandwiches. There are TONS of ways to include small sandwiches in bento boxes. 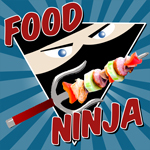 This sandwich is a bit more conventional, but be sure to check out the lesson on sandwiches to get lots of ideas provided by Susan Yuen of Hawaii's Bento Box. Another French charmer--love it, Sonoma Bento. This looks yummy indeed, great work and thanks for sharing your French inspiration!